chilli | An adventure with food. Oh look, I cooked fish again and oh look I cooked it with fennel. This is mainly a Hairy Dieter’s recipe, with some tweaking. When you’re ready to eat, preheat the oven to 220oC/425oF/gas mark 7 tear off a piece of foil large enough to bake the salmon in. Lay out on a large oven tray, I recommend using a deep one in case of leakage. Remove the tough outer fennel leaves and cut off the manky bits (for want of a better word). Halve from top to bottom, lay flat side down then cut into thin (2mm) wedges from outside edge to centre. Put out on the foil with the spring onions then carefully place the salmon fillets on top, skin side down. Not going to lie, hands really are the best way of doing this. Drizzle over about half of the marinade, pull up the sides of the foil and scrunch together to form a seal. Put in the oven for 15 minutes, bring out and check. My oven is a bit of a cold-burner and mine took a fair while longer. Meanwhile reduce the rest of the marinade on the hob until viscous and sticky. When the salmon is ready, plate up with the fennel, some steamed veg and drizzle over the reduced marinade. Place a sheet of baking parchment on a baking tray and lightly flour a surface ready for your dough. Sift the flour into a large bowl, add the salt to one side and the yeast to the other. Add half the chilli and coriander, 2 tbsp coconut and and most of the water. Use your hand to mix it all together, adding the remaining water a little at a time until you have a well-mixed, slightly wet dough. Tip out the dough and knead for 10 minutes. Roll into a ball then squash down into a round – make sure to put more flour down to stop it sticking. Pick up and place on the baking parchment and squash out further until approximately 1cm thick. Dimple the surface with your fingers, add the remaining chilli, coriander, ginger, coconut and spring onions and give a healthy drizzle of olive oil. Cover with cling film and stick in a warm place to prove until doubled in size. Preheat the oven to 190oC/375oC/gas mark 5. Remove the clingfilm and put the bread on the middle shelf for 25 minutes or until golden brown. Tap to check whether it’s cooked, it will sound hollow if it has, if not stick back in for 5 minutes. Either serve with a soggy curry or drizzle with oil and serve on its own. Courtesy of the Hairy Bikers from their dieting book. Not that either of us are dieters. Not that it’s even our book. *I used tinned simply as that’s all we had. If you have fresh (and it will undoubtedly taste better if you do) use 200g of that! Preheat the oven to 190oC/375oC/gas mark 5 and set aside a bowl. Heat some olive oil in a large casserole dish, brown the lamb with some salt and pepper and place in the bowl. Add the onions to the casserole dish and cook over a medium heat for 7-8 minutes before adding the garlic, chilli, curry paste and grating in the ginger. Cook for a further five minutes before removing from the heat and blitzing to a paste with a hand-blender. Return the lamb to the paste and return to a medium heat, cooking and stirring for 5 minutes or so until throwing in the chopped tomatoes, coconut milk, potatoes, bay leaves and enough water to cover everything. Season with salt and pepper and add a spoonful of sugar, give a good stir before adding the lid and whacking in the oven. Cook for 60 minutes, check then stick back in for half an hour. Remove from the oven add the tomatoes, spinach and cook on the hob, for five minutes. 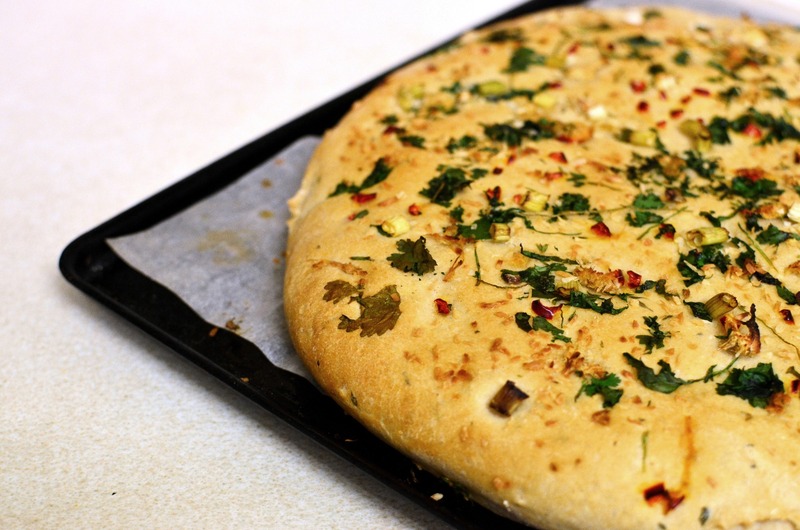 Serve with a lovely curry-soaking flatbread. 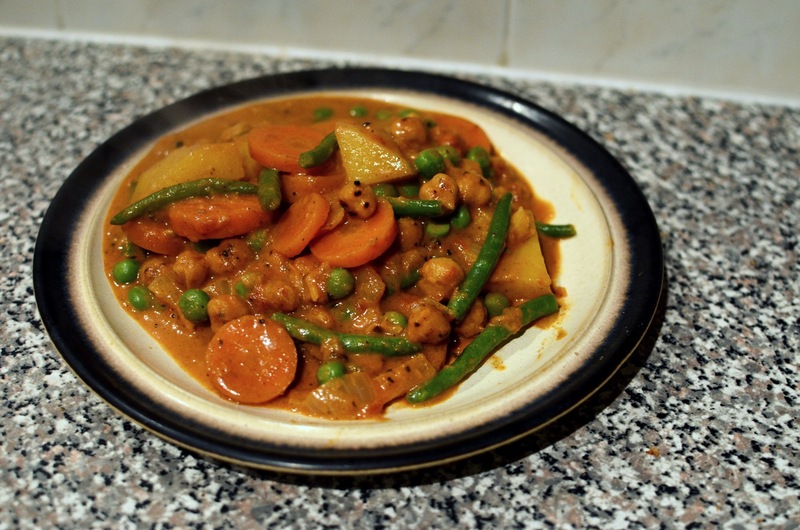 Originally I intended this to be a sweet potato and chickpea curry, however when I went to retrieve the desired ingredients the “sweet potato” in my cupboard turned out to be a very red-skinned standard potato! Shocking, I know. Not to be deterred however, I bravely soldiered on and thus present you with the fruits of my labour. I really think toasting the chickpeas is worth it, you get so much more from the spices and it’s not exactly much of a faff! It looks like a lot of ingredients but it really isn’t complicated to cook. 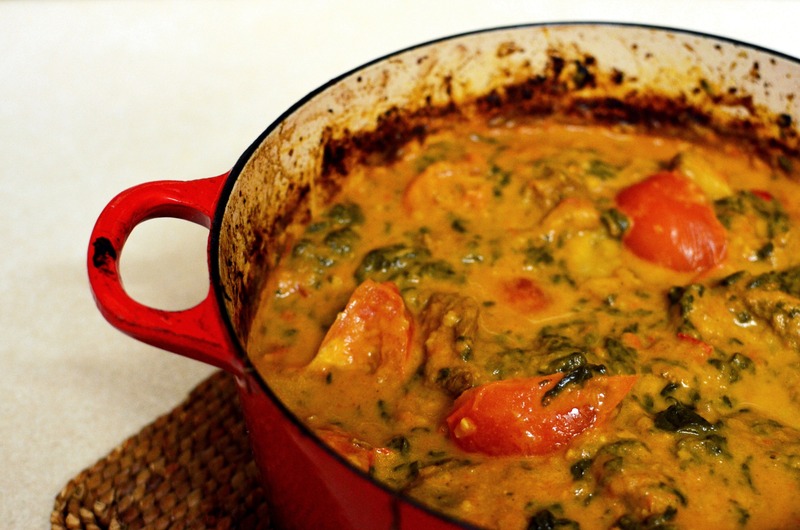 That’s one of the reasons I love curry – you can turn out something incredible with very moderate effort! Mix up the spices and set aside. In a large casserole dish heat a little oil over a medium heat and add the onions. 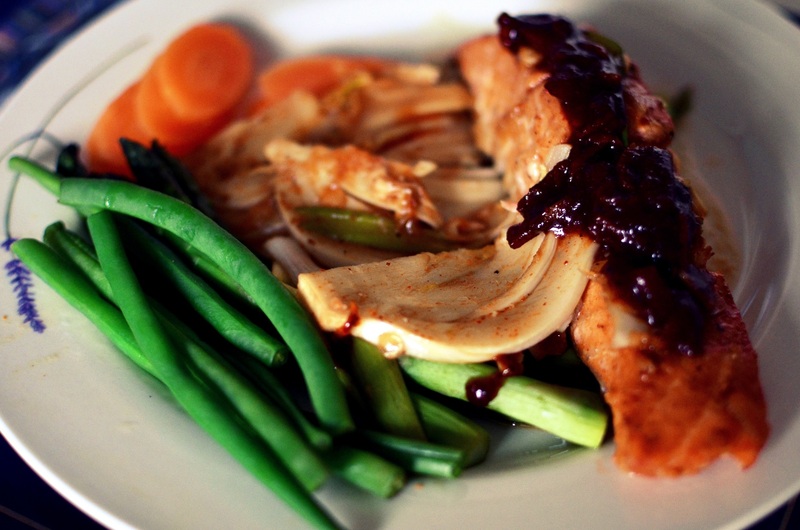 Sweat for 8-10 minutes before adding a glug of golden syrup, garlic, grated ginger and 2/3 of the spice mix. Give a good stir and cook for a further five minutes, adding a splash of water every now and again if anything starts to stick. Add the chopped tomatoes, coconut milk, potato and cinnamon stick, bring to the boil then reduce to a simmer. Make sure everything is covered in liquid – if not add a little water. Cover and leave to simmer to 20-25 minutes, stirring occasionally to remove anything stuck to the bottom of the pan. Check the potato and carrot every now and again with a knife – once they start to go soft add the peas and beans and cook for a further five minutes. Meanwhile heat some oil in a separate frying pan. Add the drained/patted dry chickpeas and fry for 5-6 minutes over a medium-high heat. Shuffle regularly to get an even covering. Add the remaining spice mix and continue to toast for a further couple of minutes until golden brown. Throw into the curry, stir everything around, season to taste (I always keep the spices I have used to hand during cooking so they can be added when necessary). Chug in one final glug of syrup and serve with a paratha. Look, I even managed to take a photograph this time! I get the impression Chicken Korma is somewhat of an unloved second-cousin to what springs to most people’s minds when they think of curry. This reputation is no doubt bolstered by the fairly weedy offerings from supermarkets and take-aways and in my opinion is completely undeserved. Korma can be delicious. Creamy, nutty, spicy, it’s a wonderful taste experience. This recipe is taken almost verbatim from John Gregory-Smith’s Mighty Spice cookbook, a Christmas present from my sister. It’s extremely quick – although you will need some kind of processor/blender – so if you’re after curry-in-a-hurry you could probably knock this up quicker than you could order and receive a take-away. Add the coconut milk, nuts, ginger, chilli, coriander, cumin and salt to the food processor and whizz until smooth. Heat a little oil in a decent-sized frying pan/saucepan over a medium heat and add the onions. Sweat for 5 minutes then add the curry powder, stirring to coat the onions. Add a little water if it starts to stick to the pan. After a couple more minutes add the chicken and cook, stirring every so often. After a further five minutes throw in the coconut paste and stir to cover everything. Squeeze in the lime juice, bring to the boil then add a lid and reduce to a simmer. Cook for approx. 15 minutes, stirring every now and again. With 10 mins to go throw in the carrots and for the last 5 minutes, remove the lid and increase the heat to thicken up the sauce – if it gets too thick just add water. Sorry, again no photo. Really need to get back into taking pictures of things before I scoff them! You could totally throw in some spinach or kale into this to up the veg content too. Insert photo of casserole dish + rice + chicken + golden cheesy topping mmmmye. Serves two, or one plus a couple of lunches. Heat the oven to 180*. Heat oil in a frying pan and throw in the onions and chopped peppers. Stir for around five minutes to soften, they should not be browning too much. Throw in the chicken and seal the edges – again do not allow it to brown. Add the spices to the pan and stir for around a minute to coat the chicken and veg. Add the uncooked rice (be brave) to the casserole dish and throw in the chicken, onions and pepper mixture. Cover with boiling water to just cover the food, then add a little bit more. Crumble in the stock cube and add some more spices if you fancy. Season well with salt and pepper. Bang it in the oven for 20 minutes. After 20 minutes, remove from the oven, give it a stir. If it is looking dry – as in the rice has taken up nearly all the water by this point, add a cup more. Stir in the soured cream or cream cheese. Bake for a further ten minutes. By this stage, there shouldn’t be too much water, but the rice may be a bit sticky. If yours is not, it needs a little longer. When the rice gets to the sticky stage, finely grate the cheese over the top. Bake for 5 minutes until the top is melty and a little bit crispy. YUM. Let me start off by saying I’m not really a fan of tomato soup per sé. That may seem a little contradictory given the nature of this recipe, but this soup is far from the thick gloop you get from Heinz and co. It’s light, it’s summery, it sizzles, it puts to shame the tasteless carbon-copy sludge you’ll find in a can. Sure chopping everything up takes a while but this is really easy (cook, add, stir, cook, add, stir, eat) makes a lot and you can freeze whatever you don’t use straight away so in my mind the extra effort is worth it. P.S. If anyone can think of a snappier/sexier title do let me know! Melt 50g butter in a deep pan. Add and sweat the onions, celery and garlic for 5 minutes over a low-medium heat, stirring occasionally (that seems to be my favourite phrase) before slugging in a glug of balsamic and continuing to cook for a further 5 minutes. Add the chopped tomatoes, chillis, beetroot, coriander and cumin, stir and cook for a further 10 minutes. 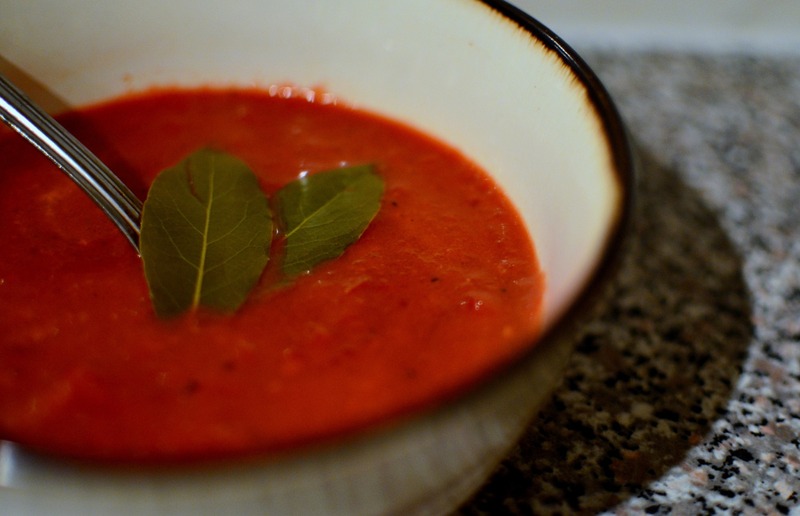 Add the vegetable stock, tinned tomatoes, bay leaves and rosemary. Get the mixture to a temperature where it bubbles nicely without spitting molten liquid all over the place and cook for 15-20 minutes, stirring occasionally (see!). Basically reduce to a thickness of your choosing. I left mine at the thinner end of the spectrum but you could continue to boil away for as long as you so wish. Season with salt and pepper and serve ideally with some fresh-baked bread. Not that I did, but hey, I would have if I wasn’t so lazy busy making soup.